This short film was recently featured on National Geographic in their short films showcase. A story of two canoeists in their 70s who are still out there kickin it. It’s too good not to share. “35 years after their first visit to the Noatak River in Alaska’s wild and spectacular Brooks Range, two adventurers in their 70’s reflect on a lifetime of outdoor experiences and what still awaits them. Equipment provided by Canon, Kessler Crane & Osprey Packs. Filmed in Gates of the Arctic National Park, Alaska. It’s been a long time since I’ve had the opportunity to do any video editing or head outdoors for that matter! I took a break from work to peace together clips from my over nighter camping trip to the mountains of Virginia in 2017. There are several clear lakes in Virginia. Switzer Lake is one of them. Enjoy! This was filmed on a Sony a6000. 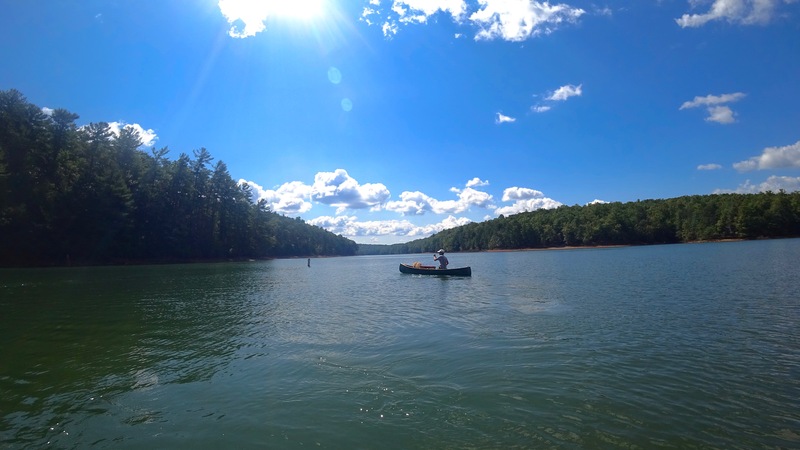 For those that are interested in canoe camping, Philpott Lake in southwest Virginia just may be the best place to learn. 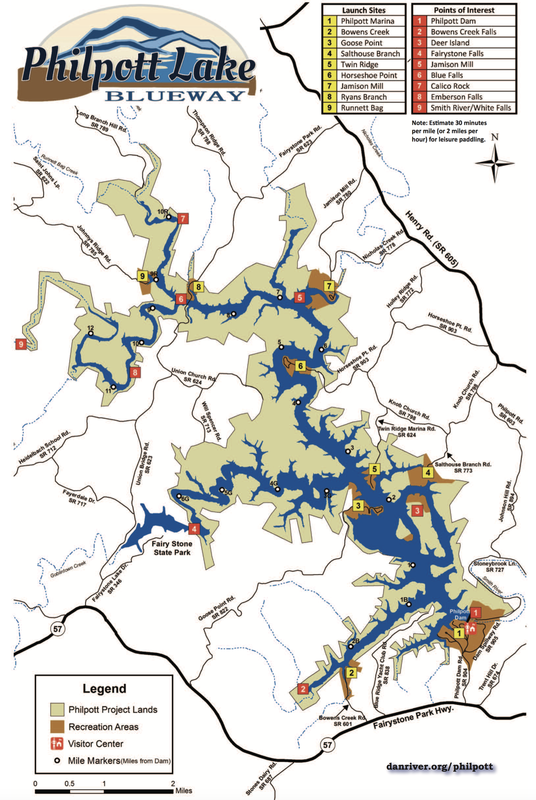 This massive 3000 acre reservoir spans across three counties (Henry, Franklin and Patrick counties) and was constructed by the U.S. Army Corps of Engineers (from 1948-1952) in order to help control flooding from the Smith River as well as generate hydroelectric energy and serve as a place for recreational activities. We took to the road on a Thursday morning with clear, blue skies. 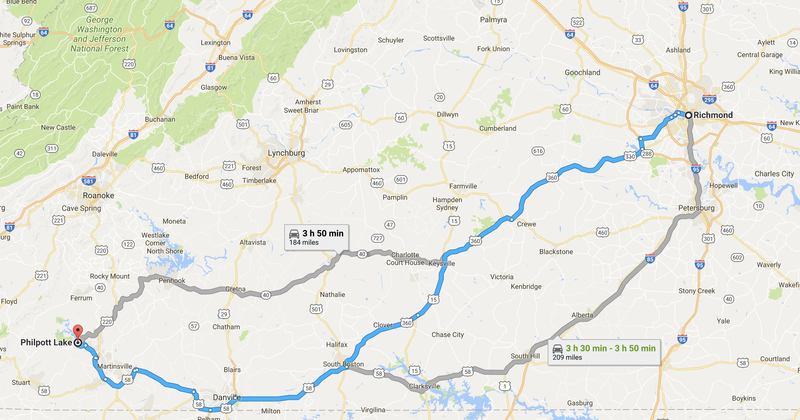 It was an easy, and flat 3.5 hour drive from Richmond to the town of Bassett, Virginia. Upon arrival to the lake, we were impressed with how clean and organized the park seemed to be. We stopped by the visitor’s center to ask for some maps and it reminded of very much of a welcoming center you would see at an Ontario Provincial Park. There were stuffed animals on display, with fish species charts that covered the walls. 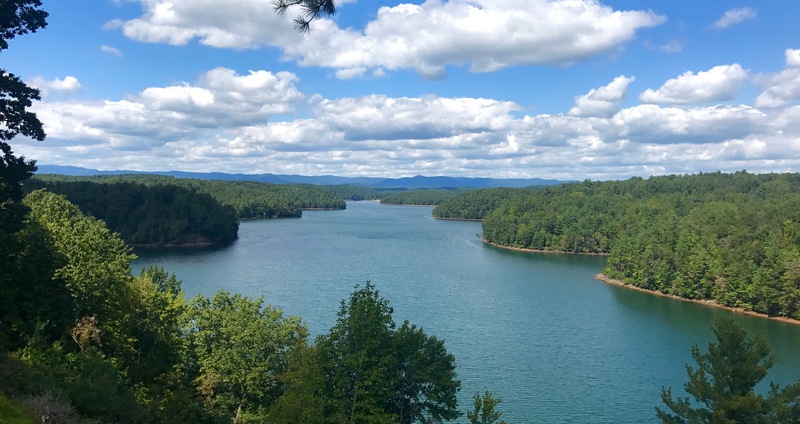 From the visitor center, we were at a great vantage point and had a beautiful view of the Philpott Dam and Lake, sparkling blue in the sunlight. We were eager to paddle these waters. 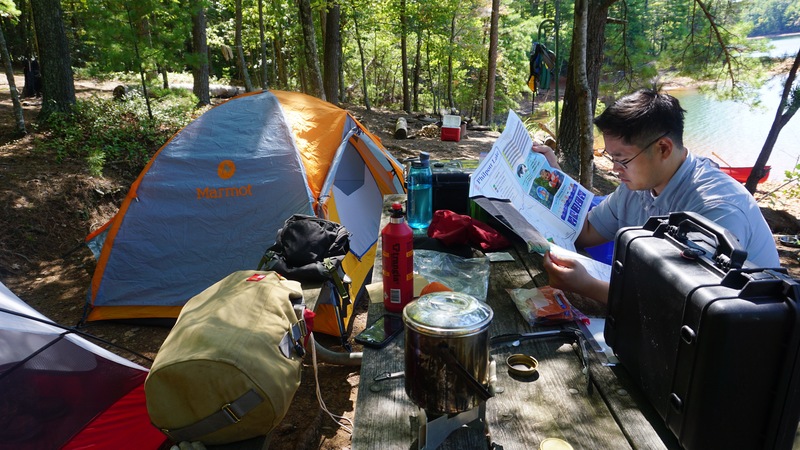 We would be camping on Deer Island, a spot where visitors can visit if they wished to do some primitive camping. In order to get there, we got back in the car and drove to the Salthouse Branch Launch Point. Here we met a friendly ranger and paid our $20 per night camping fee. We reassured us, that if we would need anything at all throughout the night, that there would be a ranger on call 24/7. We parked the car right next to the beach and launch site and began unloading our gear. Once again, this is a very well kept lake, and the launch site had every facility we could have asked for, clean bathrooms and showers, picnic tables, and water fountains. We loaded our gear off a small dock next to the public beach and set out for the quick paddle to Deer Island (less than 0.5 miles). There wasn’t a single soul camping on Deer Island so we took our time circling the land until we found a suitable campsite…..#20. The campsite was immaculate without any signs of garbage. Once our camp was set up and the firewood had been cut, I went in for a refreshing dip. While we were camping in Virginia, my brother Brian had been on a week long road trip up north in Manitoba, Canada. He was driving home to Virginia and would be joining us at Philpott Lake before we all head back to Richmond together. He was exhausted from spending days on the road. 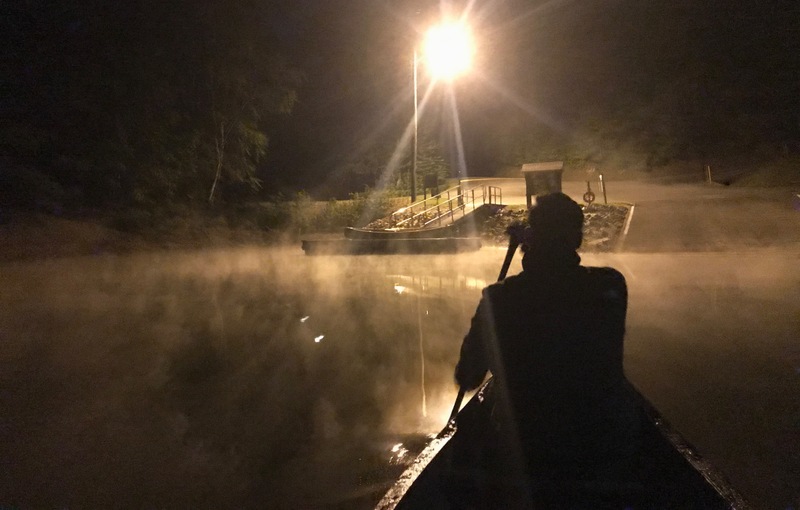 At midnight, we paddled back out under a full moon and cut through the fog on the water back to the Salt House Branch Landing. We helped him load his gear and we brought him back to the campsite. 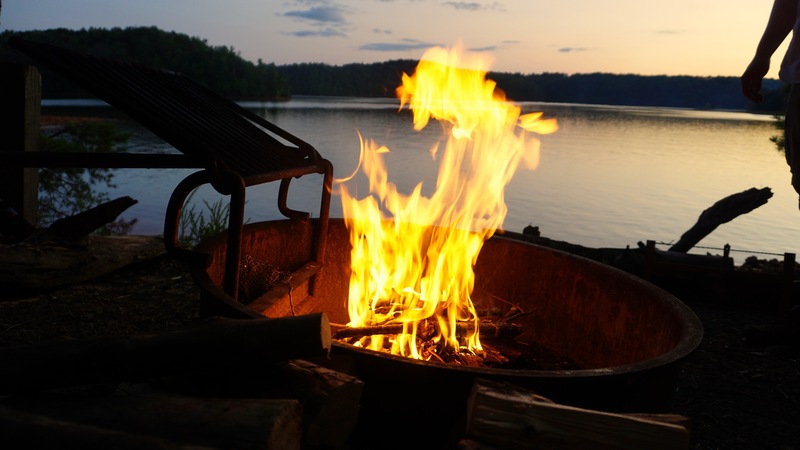 The orange glow of our campfire guiding us home. He was tired and covered in camping scars, after run ins with poison ivy, black flies and mosquitos. He was certainly happy to be back in Virginia, where they were literally no mosquitoes at our campsite. We were not complaining but we were wondering why there were no bugs. I wonder if this is due to the fact that Philpott is a man-made lake. The elements that make a natural ecosystem where mosquitoes would thrive are not there. I have no idea, but we are not complaining. 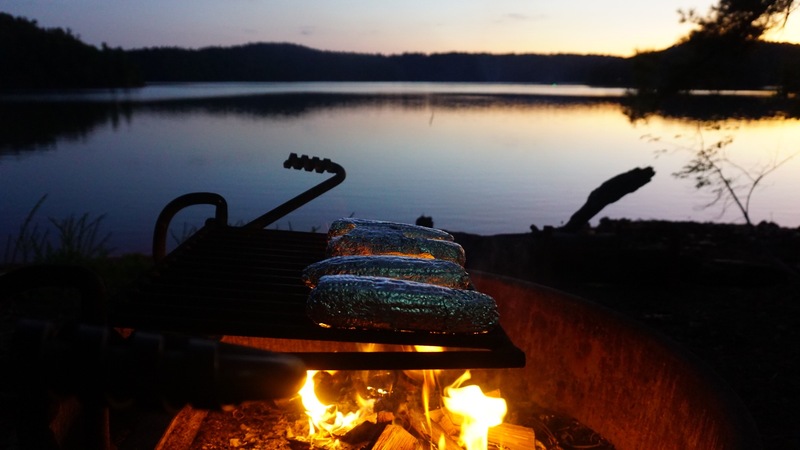 No need for a bug shelter or even bug spray for that matter.As we cooked him some dinner, he shared tales of his adventures up north, we listened intently by the fire and our group once again reunited. The last time the three of us were together was one year ago, when we paddled our way through La Verendrye Wilderness Reserve, in Quebec. Brian solo camping at Kwasitchewan falls, Manitoba. In the morning, we paddled out to the access point for a luxury shower at the Salt House Branch beach. This was truly glamping. The washrooms at Philpott Lake, just like everything else was very clean. 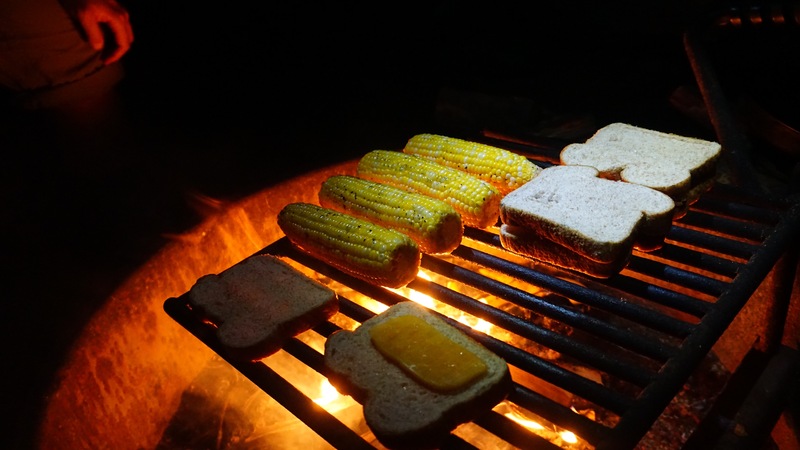 This was something I could get use to on canoe camping trips. It turned out to be a very lazy day for us. Brian was exhausted from his road trip, so we took it easy and explored the surrounding forest. We made fires from pine sap, cooked and relaxed. No ambitious goals, just us and the lake. Before we knew it, the sun was coming down, and the forest was cooling off. We went on more night canoe paddles and explored the other launch sites. We met a friendly ranger and a police officer and spent some time talking to them. The ranger was clearly interested in our canoe camping ensemble and asked where we were from. Turns, out that he had been to Ontario…. many times. He hunted and fished in the backwoods of Ontario near and was very familiar with Algonquin Park. Small world. 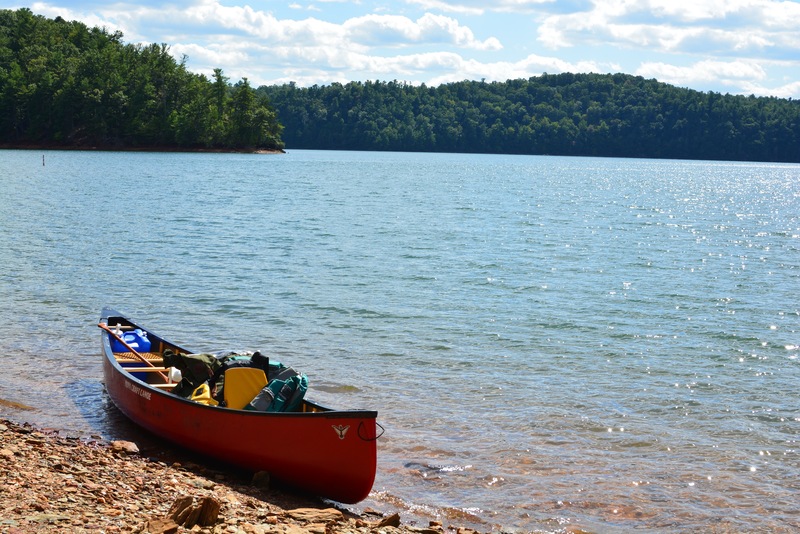 In summary, Philpott Lake is a clean, beautiful, and fun place for anyone interested in primitive canoe camping. 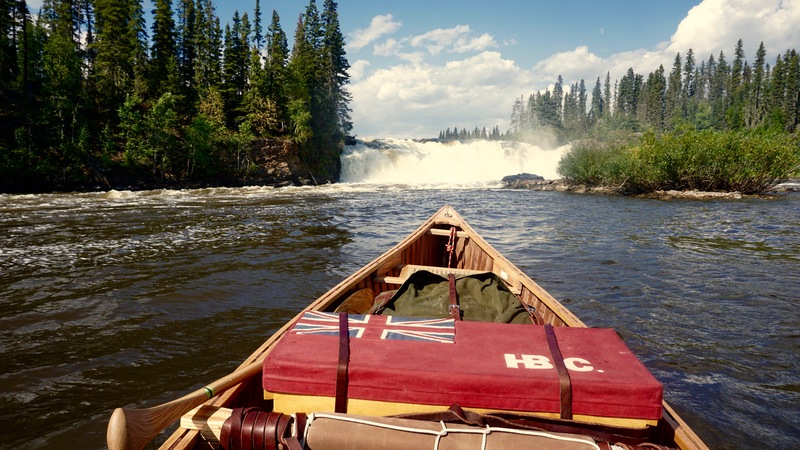 It is the perfect place to learn all of the motions involved in canoe camping. The short paddles to the campsites make it very feasible for all ages, and the access to clean facilities make it seem like clamping. There are rangers and campers around so there is also plenty of support. The rangers patrol throughout the night at the access points to keep everyone safe. 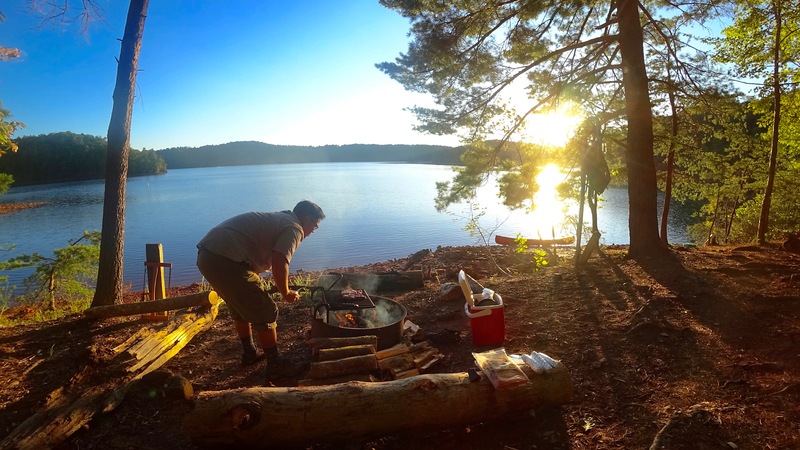 On a scale of intensity, this experience fits in between car camping, and canoe back country camping… although much closer to car camping. I would love to come back to try our hand at fishing the famous Walleye populations in this lake, perhaps in the spring time. 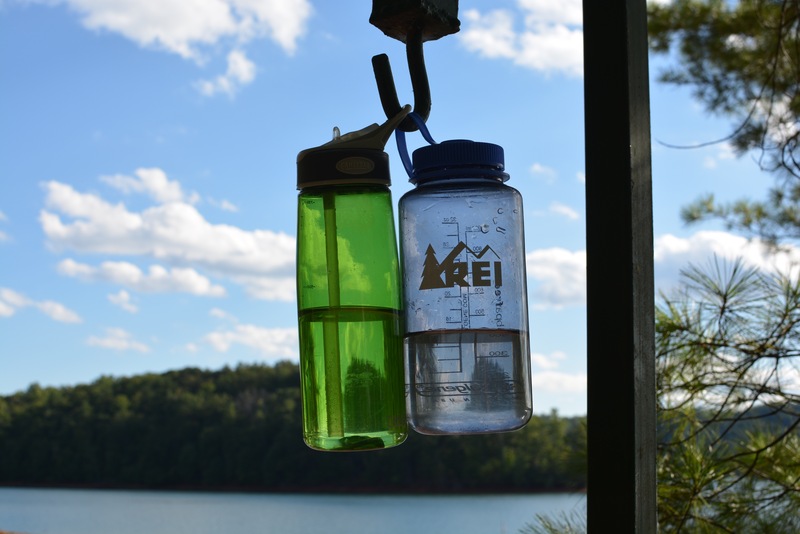 *As always, for all visitors and campers, please remember to pack out whatever you bring in. Please keep this beautiful lake clean for all to enjoy and for future generations to come.